Maduros Fritos - Basic Fried Yellow Plantains - Tienditadepuertorico.com - Buy Puertorican Food Here!! 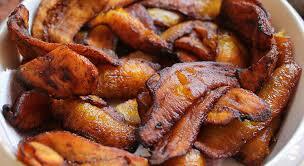 Carefully place plantains (do not crowd) into skillet and fry until golden brown on all sides. Move to a paper towel lined plate to soak oil. If you like, garnish with Tomato Olive Sauce (Mojo Isleño) - I eat mine dipped in ketchup!